This article is about the district. For the town, see Talad Chaiya. For the film, see Muay Thai Chaiya. Chaiya (Thai: ไชยา) is a district (amphoe) and town in Surat Thani Province in southern Thailand. The town itself has a population of 13,133 (5,549 in Talad Chaiya and 7,582 in Phumriang) (2006), while the whole district has a population of 47,750. Neighboring districts are (from the south clockwise) Tha Chang, Kapoe (Ranong Province), Phato (Chumphon Province), and Tha Chana. To the east is the Gulf of Thailand, with Cape Sui marking the northern end of the Bandon Bay. The eastern part of the district consists of mostly flat low coastal areas, while to the west are the mountains of the Phuket mountain range, including the Kaeng Krung National Park. Chaiya is one of the oldest cities of Thailand. The name might be derived from its original Malay name "cahaya" (meaning "light", "gleam", or "glow"). Some scholars identify Chai-ya as coming from Sri-vi- "ja-ya". It was a regional capital in the Srivijaya kingdom in the 5th to 13th centuries. Some historians even claim that it was the capital for the kingdom for some time, but this is disputed. Wat Phra Borom That is centered on a reconstructed stupa in Srivijaya style. The nearby branch of the National Museum has several relics of that time on display. Two more former stupas nearby are now only brick mounds. Inscription 23, as it was labeled by Prince Damrong in his Collected Inscriptions of Siam, is now attributed to Wat Hua Wiang in Chaiya. Dated to the year 697 of the Mahasakkarat era (i.e., 775 CE), the inscription on a Bai Sema shaped stone tells about the King of Srivijaya having erected three stupas at that site and possibly the one at Wat Phra Borom That. Another important temple near Chaiya is Wat Suan Mohkha Phalaram (also known by the short name Suan Mok, or Wat Than Nam Lai "Monastery of Flowing Water"), a forest temple. The temple was founded in 1932 by Phra Buddhadasa (1906-1993), a highly revered Buddhist teacher. In 1959 the temple was relocated to the present 150 acre (0.6 km²) site. These temples are believed to have been used to store rice in large quantities, due to the invading Japanese. These large Buddhist rice temples are rare in the region and only one has been officially labeled as a rice storage temple. Chaiya is on the southern railway line, Chaiya Railway Station is the main railway station of the district. The Asian highway AH2 (Thailand Route 41) also passes the city. The district Chaiya is divided into nine sub-districts (tambon). These are further divided into 54 villages (muban). 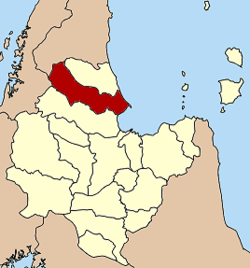 There are three sub-district municipalities (thesaban tambon): Talad Chaiya includes most of tambon Talad Chaiya and parts of Lamet; Phumriang the entire tambon Phumriang; Wiang the entire tambon Wiang. The other six sub-districts each have a tambon administrative organization as their local government.